This post is sponsored by Consumer Crafts. Thank you for supporting the brands that keep the crafts coming! I have a craft hoarding problem. Like seriously bad. But it kinda comes with the job. I never know when I will need that tube of paint or that extra glue stick, so it’s not like I can really get rid of it when I may need it for a craft project one day. Right?! So, in an effort to organize my space a bit more, I naturally crafted up a few cute storage boxes. 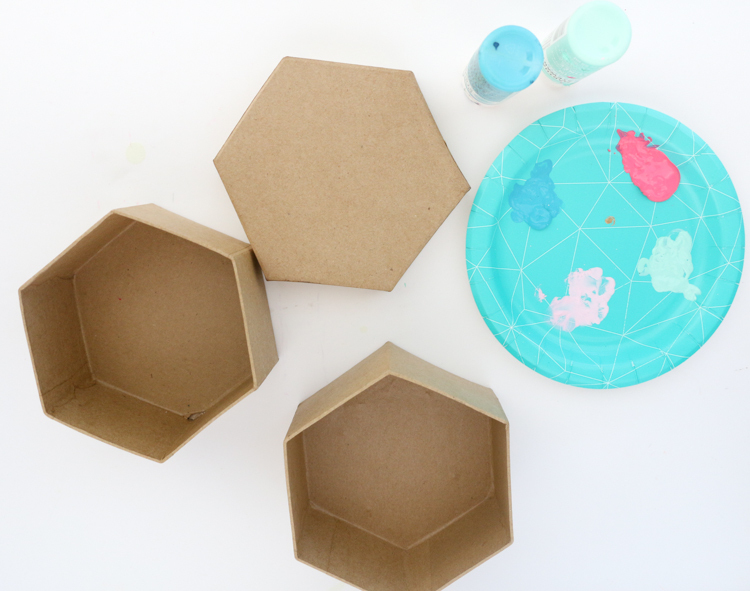 These faux wood hexagon boxes will not only look super cute up on my shelves organizing all my supplies, but they are a snap to put together! Begin by measuring the sides of your box and cutting your wood veneer sheets to this size. 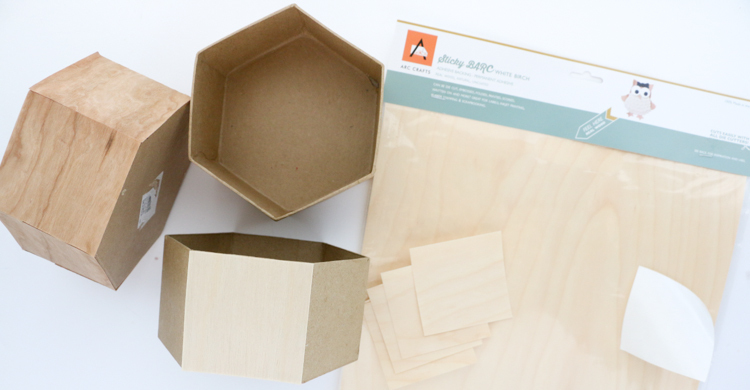 For the hexagon and square boxes, I recommend cutting individual squares or rectangles for the sides, but for a circle box, you could cut one long strip to wrap around the sides. Then simply remove the paper backing and stick the wood veneer to the sides of the box. Next, use your acrylic craft paint to paint the lids of the boxes. You can also paint the interior of the box a coordinating color for an extra color pop. Once the paint is dry, your boxes are ready to be filled with all your office supplies, craft supplies, or even bathroom goodies like q-tips, cotton balls, and make-up remover pads. Now won’t these look cute all stack up in my office built-ins?! Wonderful project!!! Thanks for sharing and giving me ideas. Really love the ideas for making the boxes.